It is always fun to look back on an interior build that we did and reflect on our experience with it. Here we sit down with SHELTER owner and designer Todd Conger to ask him a few questions about the INDUSTRY restaurant build in Tualatin, Oregon. Industry Restaurant was a full design x build for SHELTER . The owner came to us with a good design of their kitchen and bar, yet a rough idea for the remainder of the space. We worked side by side to create an environment that would be a bold statement for the area, yet one that would be warm and inviting to all. What started as interior design layouts and renderings eventually turned into mostly all the wood and metal fabrication you see in the space today. We enjoyed creating the completely custom booths, tables, bar stools, bar racks, fire pits, lighting elements, art installations, wood cladding, sinks, bathroom stalls, wayfinding display board, and more. 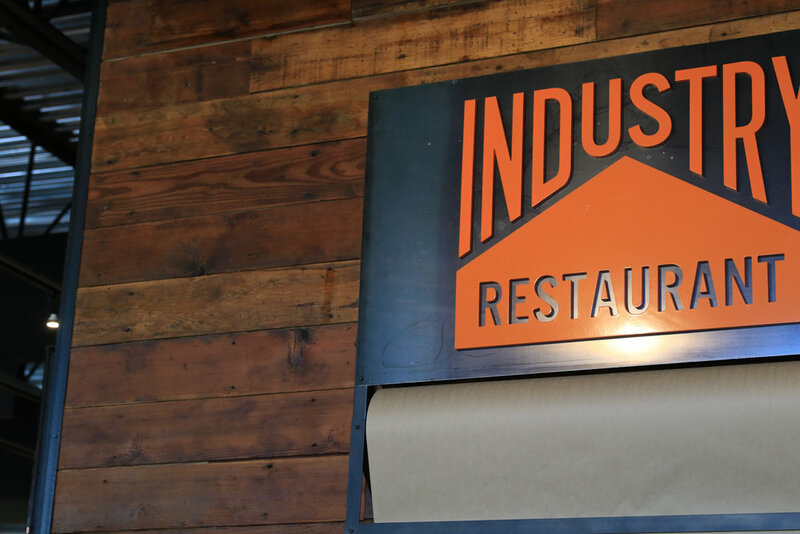 The overall design for Industry was based on its location in the industrial heart of Tualatin and Sherwood. Sitting alone and away from all other main retail and restaurant locations, Industry restaurant was placed to serve those of the industrial and commercial surrounding areas. As with its placement in a commercial area, we strived to continue that rugged working feel throughout the restaurant and to give indications both bold and subtle to tools of the trade. When creating many of the fixtures for the space, we found many objects from old agricultural and livestock farms, and made many new items that reflected industrial equipment and the mechanics of production facilities. It’s hard to pick only one element since they all go hand in hand with one another, however the booth seating and its mobile dividers are very keen to us. There are three main booth sections in the front-center of the restaurant that can house guests from small parties up to parties of twelve+ in each booth. In the center of that booth area there are bright orange dividers placed on a bearing track system that allows the dividers to move from one end of the table to the other, allowing the table setting area to be modular and fit the size of the incoming party. 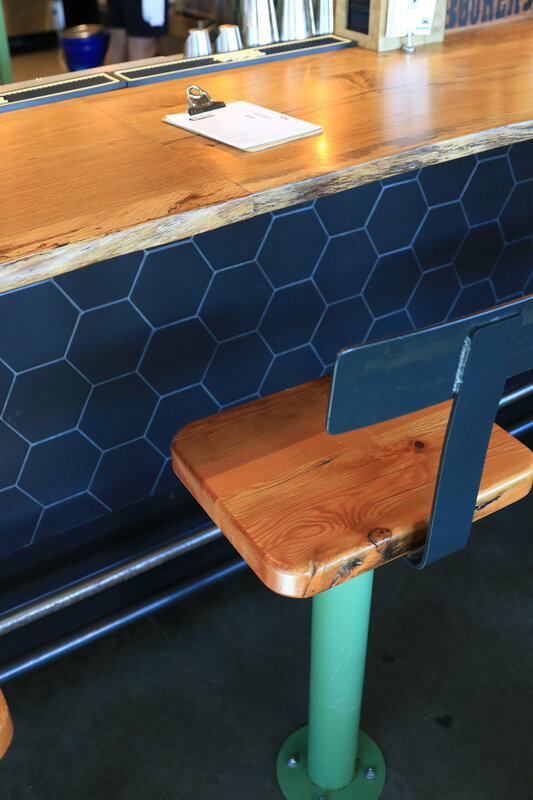 The owner had used a similar concept in some of their other restaurants, but it was fun to give it more of an industrial feel and to make it using repurposed assembly line machine wheels, allowing it to roll easily into any position. The most challenging and one of the largest elements in the space was the design and build of the waterfeature / bar table. In most cases a water fall feature is pretty simple, however in this case it was struggle to get the water to flow evenly across the face of it while not splashing too much water below since customers would be sitting around the perimeter of the piece. We eventually got it dialed, yet in the end it required too much work for the employees since the water evaporated out of the unit too quickly. We decided to pull the plug on the unit and to convert it into a candle/lighting piece. It is still a very dramatic piece in the place and has a rich orange patina to the corten steel material that accents the restaurant nicely. We are always learning from our projects. Each location that we design and build, requires that we constantly follow up and see how the work flow is going and how customers are responding to the environment. There will always be areas or things that don’t respond positively with everyone since we are all so different, so it is always of great value to evaluate those concerns and to learn from them so that we can continue to grow as restaurant designers and better serve the needs of customers. To see more pictures of Industry click here.